If you buy a cheap cordless power tool, it often happens that after a while the battery is defect and you throw that thing into the garbage, because you don't get any spareparts for that device? That doesn't need to be. If you have a 12V power grid in your weekend house, it's no problem to fix a cable (2 x 2,5 mm²) with a 12V plug on that device (watch the polarity!) 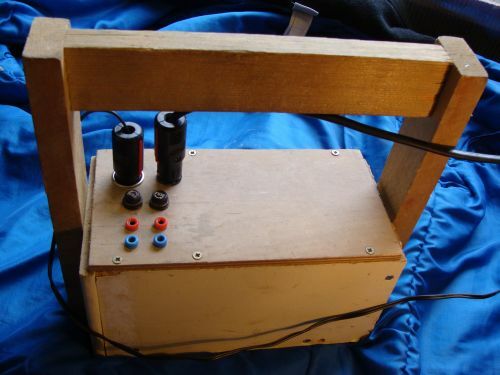 - and now you can use that power tool on your Extra Low Voltage grid. 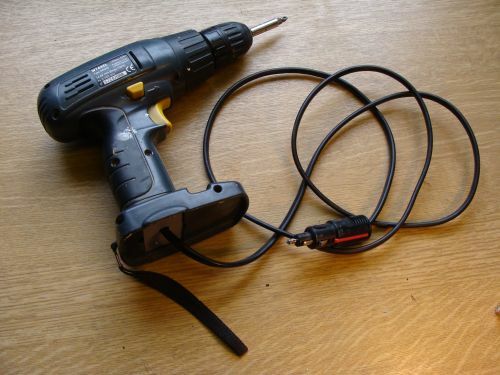 Power tools with a nominal voltage between 10 and 16 Volts can be connected to a 12V grid (eg in your car). Power tools with a nominal voltage between 20 and 34 Volts can be connected to a 24V grid. If you like it more professional, use the cable H 07 RN-F 2 x 2,5 and a CEE industrial plug 24V/16A. You want to use your power tool, which you modified according to the instruction, at a place, where you don't have the correct power grid? No problem - built a battery-box and put in an AGM or gel battery with a capacity of about 5 to 15 Ah into it (don't forget to fix the battery well into your battery-box!). Now you built in 2 - 3 plug sockets for extra low voltage. Don't forget to connect the plug sockets over a fuse of 10 to 16 A for each plug socket. Now you have the energy for your Extra-Low-Voltage consumers always with you. You can easily charge the battery by connecting it over a cable with 2 plugs to your 12V grid. You don't have to care about overcharging, because the charge regulator of your power system limits the voltage to end-of-charge voltage. You don't have to care about a memory effect either, because you can recharge lead batteries any time and it's best when they are always fully charged. If you have a 24V system, you can connect 2 batteries with 12V in series. Safety hint: Short circuits on accumulators are dangerous and can cause fire. They can even lead to the explosion of the battery! So use always the correct fuse and don't connect a device directly to the battery! Always use AGM or gel batteries for mobile purposes because the acid of lead acid batteries can come out if the battery falls! You need 230 V or 110 V AC to go? No problem either - make a battery-box with a battery of at least 30 Ah and mount a CEE plug socket 24V/32 A. Connect it over a 35 A Neozed fuse to the battery. Now you can connect an alternator with a cable of at least 10 mm² and a CEE plug to your battery box and the alternator provides you with AC power. As it is difficult to get 2-wire cables with more than 6 mm², I recommend you to use the cable H07 RN-F 4 x 6 mm². Then connect 2 wires in paralell for each pole and now you have 2 x12 mm². Safety hint: Pay attention to good contacts! The high currents can cause dangerous heat! At a short circuit current of 170A it can last up to 5 seconds until a 35A Neozed fuse is blown! To blow the fuse immediately, you need a short circuit current of over 300 A! Use only wires which are big enough! You can purchase used car radios very cheap and they usually have a really good sound,if you operate them on good speakers. But first,you need a nice casing. You can built it by taking wood or something else. Don't forget to make enough ventilation slots,so that the radio doesn't get too hot. For stereosound you can built in your casing 2 loudspeakers. To connect this radio to your Extra Low Voltage grid,take a 2-wire cable of at least 1,5 mm² which has a 12V DC plug on the other end. Just connect an aerial-and it's ready for listening radio,CD or cassette. As most car radios have 4 loudspeaker outputs you can lead the 2 not used outputs to speaker terminals on the rear side of your radio casing. Connect 2 normal speakers eg from an old stereo to these terminals,and you have full sound with 4 speakers. If you have a 24V grid in your weekend house,you can buy a voltage - transformer 24V DC to 12V DC and built it in your radio casing. First mount a socket GU 5,3 on a small piece of wood. Now connect a 2-wire cable with an Extra-Low-Voltage plug on the other side of this socket. 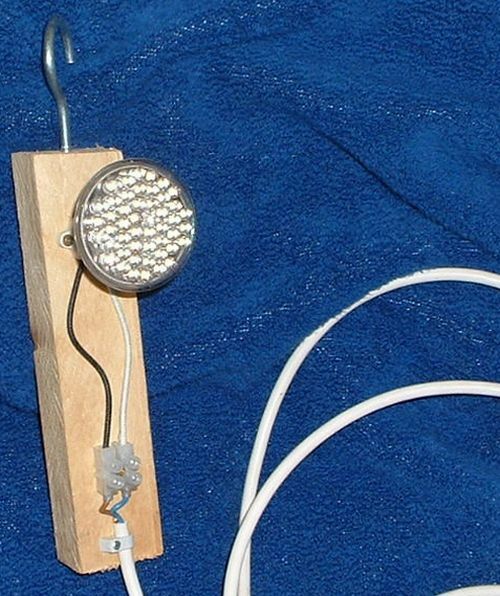 Screw in a hook on the upper side,so you are able to hang this light for example on a branch of a tree. Now plug in a LED-spot into the socket-and you have a nice spotlight for your garden. Don't forget to bring this light into your house after use,as it is not waterproof.